This article is about the set of ideas and practices termed Dianetics. For the book by L. Ron Hubbard first published in 1950, see Dianetics: The Modern Science of Mental Health. For the original article by Hubbard expanded into a book, see Dianetics: The Evolution of a Science. Not to be confused with Diuretics, Dialectics, or Dynetics. Dianetics (from Greek dia, meaning "through", and nous, meaning "mind") is a set of ideas and practices regarding the metaphysical relationship between the mind and body created by science fiction writer L. Ron Hubbard. Dianetics is practiced by followers of Scientology, the Nation of Islam (as of 2010), and independent Dianeticist groups. Dianetics divides the mind into three parts: the conscious "analytical mind", the subconscious "reactive mind", and the somatic mind. The goal of Dianetics is to erase the content of the "reactive mind", which Scientologists believe interferes with a person's ethics, awareness, happiness, and sanity. The Dianetics procedure to achieve this erasure is called "auditing". In auditing, the Dianetic auditor asks a series of questions (or commands) and elicits answers to help a person locate and deal with painful experiences of the past, which Scientologists believe to be the content of the "reactive mind". Practitioners of Dianetics believe that "the basic principle of existence is to survive" and that the basic personality of humans is sincere, intelligent, and good. The drive for goodness and survival is distorted and inhibited by aberrations "ranging from simple neuroses to different psychotic states to various kinds of sociopathic behavior patterns." Hubbard developed Dianetics, claiming that it could eradicate these aberrations. When Hubbard formulated Dianetics, he described it as "a mix of Western technology and Oriental philosophy". He said that Dianetics "forms a bridge between" cybernetics and general semantics (a set of ideas about education originated by Alfred Korzybski, which received much attention in the science fiction world in the 1940s)—a claim denied by scholars of General Semantics, including S. I. Hayakawa, who expressed strong criticism of Dianetics as early as 1951. Hubbard claimed that Dianetics could increase intelligence, eliminate unwanted emotions and alleviate a wide range of illnesses he believed to be psychosomatic. Among the conditions purportedly treated were arthritis, allergies, asthma, some coronary difficulties, eye trouble, ulcers, migraine headaches, "sexual deviation" (which for Hubbard included homosexuality), and even death. Hubbard asserted that "memories of painful physical and emotional experiences accumulate in a specific region of the mind, causing illness and mental problems." He taught that "once these experiences have been purged through cathartic procedures he developed, a person can achieve superior health and intelligence." Hubbard also variously defined Dianetics as "a spiritual healing technology" and "an organized science of thought." Dianetics predates Hubbard's classification of Scientology as an "applied religious philosophy". Early in 1951, he expanded his writings to include teachings related to the soul, or "thetan". Dianetics is practiced by several independent Dianetics-only groups not connected with Scientology,[clarification needed] and also Free Zone or Independent Scientologists. The Church of Scientology has prosecuted a number of people in court for unauthorized publication of Scientology and Dianetics copyrighted material. L. Ron Hubbard published Dianetics on May 9, 1950, as a "branch of self-help psychology". In Dianetics, Hubbard introduced the "phenomena known as 'engrams'" as the source of "all psychological pain, which in turn harmed mental and physical health." He also claimed that individuals could reach the state of "clear", or a state of "exquisite clarity and mental liberation, by exorcising their engrams to an 'auditor,' or listener acting as therapist." While not accepted by the medical and scientific establishment, in the first two years of its publication, over 100,000 copies of the book were sold. Many enthusiasts emerged to form groups to study and practice Dianetics. The atmosphere from which Dianetics was written about in this period was one of "excited experimentation". Roy Wallis writes that Hubbard's work was regarded as an "initial exploration" for further development. Hubbard wrote an additional six books in 1951, drawing the attention of a significant fan base. Hubbard always claimed that his ideas of Dianetics originated in the 1920s and 1930s. By his own account, he had been injured by the premature detonation of a primer mechanism on a small depth charge that had become stuck in the launch rack aboard the navy ship he was assigned to in 1941. His injuries were mainly flash burns to his eyes and so was despatched ashore and he spent a great deal of his recovery time in the Oak Knoll Naval Hospital's library, (despite claiming in his authorised biography that he was blinded). LRH encountered the work of Thompson, Korzybski, Jung, Freud, Perls and other psychoanalysts. In his 1955 Phoenix Lectures Series, Hubbard himself, explains that he took the opportunity to enter an office where research papers on the US Naval Medical Research Division's work on PTSD were kept in a filing cabinet and he spent the lunch hour free to read the notes left lying on the desk of the Naval Medical Officer involved. Much of what he learned then, along with his recent mastery of hypnotherapy technique by mail order, was influential in his later development of ideas and concepts for Dianetics Therapy from 1947 onwards. All he needed was medical and scientific testing and approval from any source. However, his several attempts were blocked by several luminaries of the (AMA) American Medical Association in the years 1948–1958, such as Professors Duncan Cameron and Allan Whyte (White), who both were senior authorities within the AMA-funded Psychiatric Research Department, then conducting their own research into drug therapies and controversial psycho-surgical techniques on severely traumatised war veterans. Hubbard claimed in his several public lectures during the 1950s to have "undertaken clinical research at several of the institutions" they, Cameron and Whyte, had directed. Historical AMA records show that LRH was never officially involved in any approved clinical trials or research into PTSD. It is thought that Hubbard simply privately visited patients and conducted unauthorised interviews with several war veterans suffering from Trauma, Psychosomatic illness and practiced some of the newly identified PTSD techniques being clinically tested by several AMA medical institutions after WW2. (from personal Interviews with Joseph A. Winter, in Peoria,1959). Hubbard first introduced Dianetics to the public in the article Dianetics: The Evolution of a Science published in the May 1950 issue of the magazine Astounding Science Fiction. Hubbard wrote Dianetics: The Modern Science of Mental Health at that time, allegedly completing the 180,000-word book in six weeks. The introduction of the book was the subject of an Associated Press article on 29 March 1950, with the lead "Discovery of a sub-mind is claimed in a new book entitled Dianetics". When Dianetics was published in 1950, Hubbard announced in the opening pages, "The first contribution of Dianetics is the discovery that the problems of thought and mental function can be resolved within the bounds of the finite universe, which is to say that all data needful to the solution of mental action and Man's endeavor can be measured, sensed and experienced as scientific truths independent of mysticism or metaphysics." This was in line with Hubbard's initial presentation of Dianetics as a science, almost four years before he founded Scientology. Publication of Dianetics: The Modern Science of Mental Health brought in a flood of money, which Hubbard used to establish Dianetics foundations in six major American cities. Dianetics shared The New York Times best-seller list with other self-help writings, including Norman Vincent Peale's The Art of Happiness and Henry Overstreet's The Mature Mind. Scholar Hugh B. Urban asserted that the initial success of Dianetics was reflective of Hubbard's "remarkable entrepreneurial skills." Posthumously, Publisher's Weekly awarded Hubbard a plaque to acknowledge Dianetics appearing on its bestseller list for one hundred weeks, consecutively. Some of the initial strongest supporters of Dianetics in the 1950s were John W. Campbell, editor of Astounding Science Fiction and Joseph Augustus Winter, a writer and medical physician. Campbell published some of Hubbard's short stories and Winter hoped that his colleagues would likewise be attracted to Hubbard's Dianetics system. In January 1951, the New Jersey Board of Medical Examiners instituted proceedings against the Hubbard Dianetic Research Foundation in Elizabeth for 'teaching medicine without a licence', which was quickly resolved when the courts were made aware that the HDRF deputy director Winter was registered as an MD in the state of Michigan and New York. . The Foundation closed its doors when Hubbard ditched the Foundation, causing the proceedings to be vacated, but its creditors began to demand settlement of its outstanding debts. Don Purcell, a millionaire Dianeticist from Wichita, Kansas, offered a brief respite from bankruptcy, but the Wichita Foundation's finances soon failed again in 1952 when Hubbard ran off to Phoenix with all his Dianetics materials to avoid the court bailiffs sent in by Don Purcell, who had paid a considerable amount of money to Hubbard for the copyrights to Dianetics in an effort to keep Hubbard from bankruptcy again. 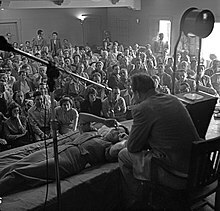 In 1954, Hubbard defined Scientology as a religion focused on the spirit, differentiating it from Dianetics, and subsequently Dianetics Auditing Therapy, which he defined as a counseling based science that addressed the physical being. He stated, "Dianetics is a science which applies to man, a living organism; and Scientology is a religion." When Hubbard morphed Dianetics therapy into the religion of Scientology, Jesper Aagaard Petersen of Oxford University surmises that it could have been for the benefits from establishing it is a religion as much as it could have been from the result of Hubbard's "discovery of past life experiences and his exploration of the thetan." The reason being to avoid copyright infringement issues with use of the name Dianetics then held by Don Purcell. Purcell later donated the copyright ownership back (to Hubbard) after Winter and Van Vogt had independently negotiated charitable debt relief with the disenchanted oil millionaire Purcell. With the temporary sale of assets resulting from the HDRF's bankruptcy, Hubbard no longer owned the rights to the name "Dianetics", but its philosophical framework still provided the seed for Scientology to grow. Scientologists refer to the book Dianetics: The Modern Science of Mental Health as "Book One." In 1952, Hubbard published a new set of teachings as "Scientology, a religious philosophy." Scientology did not replace Dianetics but extended it to cover new areas: Where the goal of Dianetics is to rid the individual of his reactive mind engrams, the stated goal of Scientology is to rehabilitate the individual's spiritual nature so that he may reach his full potential. In 1963 and again in May 1969, Hubbard reorganized the material in Dianetics, the auditing commands, and original Volney Mathieson invented E-meter use, naming the package "Standard Dianetics." In a 1969 bulletin, "This bulletin combines HCOB 27 April 1969 'R-3-R Restated' with those parts of HCOB 24 June 1963 'Routine 3-R' used in the new Standard Dianetic Course and its application. This gives the complete steps of Routine 3-R Revised." In the Church of Scientology, OTs study several levels of New Era Dianetics for OTs before reaching the highest level. In the book, Dianetics: The Modern Science of Mental Health, Hubbard describes techniques that he suggests can rid individuals of fears and psychosomatic illnesses. A basic idea in Dianetics is that the mind consists of two parts: the "analytical mind" and the "reactive mind." The "reactive mind", the mind which operates when a person is physically unconscious, acts as a record of shock, trauma, pain, and otherwise harmful memories. Experiences such as these, stored in the "reactive mind" are dubbed "engrams". Dianetics is proposed as a method to erase these engrams in the reactive mind to achieve a state of clear. Hubbard described Dianetics as "an organized science of thought built on definite axioms: statements of natural laws on the order of those of the physical sciences". In April 1950, before the public release of Dianetics, he wrote: "To date, over two hundred patients have been treated; of those two hundred, two hundred cures have been obtained." In Dianetics, the unconscious or reactive mind is described as a collection of "mental image pictures," which contain the recorded experience of past moments of unconsciousness, including all sensory perceptions and feelings involved, ranging from pre-natal experiences, infancy and childhood, to even the traumatic feelings associated with events from past lives and extraterrestrial cultures. The type of mental image picture created during a period of unconsciousness involves the exact recording of a painful experience. Hubbard called this phenomenon an engram, and defined it as "a complete recording of a moment of unconsciousness containing physical pain or painful emotion and all perceptions." Hubbard said that in Dianetics, it was the analytical mind and not the reactive mind that was the most important because the analytical mind "computes decisions" even when these are dictated by the reactive mind. The damage and aberration caused by the reactive mind would not be possible without the analytic mind. Hubbard stated, "the analytical is so important to the intelligent being and the somatic mind so important to the athlete that Dianetics processing can be said to consist of deintensifying the reactive mind so that the analytical and somatic minds can be free to function properly." Hubbard proposed that painful physical or emotional traumas caused "aberrations" (deviations from rational thinking) in the mind, which produced lasting adverse physical and emotional effects, similar to conversion disorders. When the analytical (conscious) mind shut down during these moments, events and perceptions of this period were stored as engrams in the unconscious or reactive mind. (In Hubbard's earliest publications on the subject, engrams were variously referred to as "Norns", "Impediments," and "comanomes" before "engram" was adapted from its existing usage at the suggestion of Joseph Augustus Winter, MD.) Some commentators noted Dianetics's blend of science fiction and occult orientations at the time. Hubbard claimed that these engrams are the cause of almost all psychological and physical problems. In addition to physical pain, engrams could include words or phrases spoken in the vicinity while the patient was unconscious. For instance, Winter cites the example of a patient with a persistent headache supposedly tracing the problem to a doctor saying, "Take him now," during the patient's birth. Hubbard similarly claimed that leukemia is traceable to "an engram containing the phrase 'It turns my blood to water.'" While it is sometimes claimed that the Church of Scientology no longer stands by Hubbard's claims that Dianetics can treat physical conditions, it still publishes them: "... when the knee injuries of the past are located and discharged, the arthritis ceases, no other injury takes its place and the person is finished with arthritis of the knee." "[The reactive mind] can give a man arthritis, bursitis, asthma, allergies, sinusitis, coronary trouble, high blood pressure ... And it is the only thing in the human being which can produce these effects ... Discharge the content of [the reactive mind] and the arthritis vanishes, myopia gets better, heart illness decreases, asthma disappears, stomachs function properly and the whole catalog of ills goes away and stays away." Hubbard defined the third mind, or the somatic mind, as "that mind which, directed by the analytical or reactive mind, places solution into effect on the physical level." If an individual is not suffering from aberration or engrams are not restimulated, thus causing the person to relive pain, the analytical mind controls the somatic mind, in turn controlling blood flow, the heartbeat and endocrines. When a person is "aberrated," the reactive mind controls the somatic mind. Some of the psychometric ideas in Dianetics, in particular the E-meter, can be traced to Carl Jung. Basic concepts, including conversion disorder, are derived from Sigmund Freud, whom Hubbard credited as an inspiration and source. Freud had speculated 40 years previously that traumas with similar content join together in "chains," embedded in the unconscious mind, to cause irrational responses in the individual. Such a chain would be relieved by inducing the patient to remember the earliest trauma, "with an accompanying expression of emotion." According to Bent Corydon, Hubbard created the illusion that Dianetics was the first psychotherapy to address traumatic experiences in their own time, but others had done so as standard procedure. One treatment method Hubbard drew from in developing Dianetics was abreaction therapy. Abreaction is a psychoanalytical term that means bringing to consciousness, and thus adequate expression, material that has been unconscious. "It includes not only the recollection of forgotten memories and experience, but also their reliving with appropriate emotional display and discharge of effect. This process is usually facilitated by the patient's gaining awareness of the causal relationship between the previously undischarged emotion and his symptoms." According to Hubbard, before Dianetics psychotherapists had dealt with very light and superficial incidents (e.g. an incident that reminds the patient of a moment of loss), but with Dianetic therapy, the patient could actually erase moments of pain and unconsciousness. He emphasized: "The discovery of the engram is entirely the property of Dianetics. Methods of its erasure are also owned entirely by Dianetics..."
While 1950 style Dianetics was in some respects similar to older therapies, with the development of New Era Dianetics in 1978, the similarity vanished. New Era Dianetics uses an E-Meter and a rote procedure for running chains of related traumatic incidents. Dianetics clarifies the understanding of psychosomatic illness in terms of predisposition, precipitation, and prolongation. HCO Bulletin 11 July 1973RB Injury and illness are PREDISPOSED by the spiritual state of the person. They are PRECIPITATED by the being himself as a manifestation of his current spiritual condition. And they are PROLONGED by any failure to fully handle the spiritual factors associated with them. With the use of Dianetics techniques, Hubbard claimed, the reactive mind could be processed and all stored engrams could be refiled as experience. The central technique was "auditing," a two-person question-and-answer therapy designed to isolate and dissipate engrams (or "mental masses"). An auditor addresses questions to a subject, observes and records the subject's responses, and returns repeatedly to experiences or areas under discussion that appear painful until the troubling experience has been identified and confronted. Through repeated applications of this method, the reactive mind could be "cleared" of its content having outlived its usefulness in the process of evolution; a person who has completed this process would be "Clear". The benefits of going Clear, according to Hubbard, were dramatic. A Clear would have no compulsions, repressions, psychoses or neuroses, and would enjoy a near-perfect memory as well as a rise in IQ of as much as 50 points. He also claimed that "the atheist is activated by engrams as thoroughly as the zealot". He further claimed that widespread application of Dianetics would result in "A world without insanity, without criminals and without war." One of the key ideas of Dianetics, according to Hubbard, is the fundamental existential command to survive. According to Hugh B. Urban, this would serve as the foundation of a big part of later Scientology. According to the Scientology journal The Auditor, the total number of "Clears" as of May 2006 stands at 50,311. 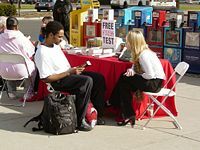 Scientologists promoting Dianetics at Union Station in Washington, D.C. The procedure of Dianetics therapy (known as auditing) is a two-person activity. One person, the "auditor", guides the other person, the "pre-clear". The pre-Clear's job is to look at the mind and talk to the auditor. The auditor acknowledges what the pre-Clear says and controls the process so the pre-Clear may put his full attention on his work. 1. The auditor assures the pre-Clear that he will be fully aware of everything that happens during the session. 2. The pre-Clear is instructed to close his eyes for the session, entering a state of "dianetic reverie", signified by "a tremble of the lashes". During the session, the preclear remains in full possession of his will and retains full recall thereafter. 3. The auditor installs a "canceller", an instruction intended to absolutely cancel any form of positive suggestion that could accidentally occur. This is done by saying "In the future, when I utter the word 'cancelled,' everything I have said to you while you are in a therapy session will be cancelled and will have no force with you. Any suggestion I may have made to you will be without force when I say the word 'cancelled.' Do you understand?" 4. The auditor then asks the pre-Clear to locate an exact record of something that happened to the pre-Clear in his past: "Locate an incident that you feel you can comfortably face." 5. The pre-Clear is invited by the auditor to "Go through the incident and say what is happening as you go along." 6a. The auditor instructs the pre-Clear to recall as much as possible of the incident, going over it several times "until the pre-Clear is cheerful about it". 6b. When the pre-Clear is cheerful about an incident, the auditor instructs the pre-Clear to locate another incident: "Let's find another incident that you feel you can comfortably face." The process outlined at steps 5 and 6a then repeats until the auditing session's time limit (usually two hours or so) is reached. 7. The pre-Clear is then instructed to "return to present time". 8. The auditor checks to make sure that the pre-Clear feels himself to be in "present time", i.e., not still recalling a past incident. 9. The auditor gives the pre-Clear the canceller word: "Very good. Cancelled." Auditing sessions are supposedly kept confidential. A few transcripts of auditing sessions with confidential information removed have been published as demonstration examples. Some extracts can be found in J.A. Winter's book Dianetics: A Doctor's Report. Other, more comprehensive, transcripts of auditing sessions carried out by Hubbard himself can be found in volume 1 of the Research & Discovery Series (Bridge Publications, 1980). Examples of public group processing sessions can be found throughout the Congresses lecture series. According to Hubbard, auditing enables the pre-Clear to "contact" and "release" engrams stored in the reactive mind, relieving him of the physical and mental aberrations connected with them. The pre-Clear is asked to inspect and familiarize himself with the exact details of his own experience; the auditor may not tell him anything about his case or evaluate any of the information the pre-Clear finds. Hubbard's original book on Dianetics attracted highly critical reviews from science and medical writers and organizations. The American Psychological Association passed a resolution in 1950 calling "attention to the fact that these claims are not supported by empirical evidence of the sort required for the establishment of scientific generalizations." Subsequently, Dianetics has achieved no acceptance as a scientific theory, and scientists cite Dianetics as an example of a pseudoscience. In August 1950, amidst the success of Dianetics, Hubbard held a demonstration in Los Angeles' Shrine Auditorium where he presented a young woman called Sonya Bianca (a pseudonym) to a large audience including many reporters and photographers as 'the world's first Clear." Despite Hubbard's claim that she had "full and perfect recall of every moment of her life", Bianca proved unable to answer questions from the audience testing her memory and analytical abilities, including the question of the color of Hubbard's tie. Hubbard explained Bianca's failure to display her promised powers of recall to the audience by saying that he had used the word "now" in calling her to the stage, and thus inadvertently froze her in "present time," which blocked her abilities. Later, in the late 1950s, Hubbard would claim that several people had reached the state of Clear by the time he presented Bianca as the world's first; these others, Hubbard said, he had successfully cleared in the late 1940s while working incognito in Hollywood posing as a swami. In 1966, Hubbard declared South African Scientologist John McMaster to be the first true Clear. Objective experimental verification of Hubbard's physiological and psychological doctrines is lacking. To date, no regular scientific agency has established the validity of his theories of prenatal perception and engrams, or cellular memory, or Dianetic reverie, or the effects of Scientology auditing routines. Existing knowledge contradicts Hubbard's theory of recording of perceptions during periods of unconsciousness. The MEDLINE database records two independent scientific studies on Dianetics, both conducted in the 1950s under the auspices of New York University. Harvey Jay Fischer tested Dianetics therapy against three claims made by proponents and found it does not effect any significant changes in intellectual functioning, mathematical ability, or the degree of personality conflicts; Jack Fox tested Hubbard's thesis regarding recall of engrams, with the assistance of the Dianetic Research Foundation, and could not substantiate it. Hubbard claimed, in an interview with The New York Times in November 1950, that "he had already submitted proof of claims made in the book to a number of scientists and associations." He added that the public as well as proper organizations were entitled to such proof and that he was ready and willing to give such proof in detail. In January 1951, the Hubbard Dianetic Research Foundation of Elizabeth, NJ published Dianetic Processing: A Brief Survey of Research Projects and Preliminary Results, a booklet providing the results of psychometric tests conducted on 88 people undergoing Dianetics therapy. It presents case histories and a number of X-ray plates to support claims that Dianetics had cured "aberrations" including manic depression, asthma, arthritis, colitis and "overt homosexuality," and that after Dianetic processing, test subjects experienced significantly increased scores on a standardized IQ test. The report's subjects are not identified by name, but one of them is clearly Hubbard himself ("Case 1080A, R. L."). The authors provide no qualifications, although they are described in Hubbard's book Science of Survival (where some results of the same study were reprinted) as psychotherapists. Critics of Dianetics are skeptical of this study, both because of the bias of the source and because the researchers appear to ascribe all physical benefits to Dianetics without considering possible outside factors; in other words, the report lacks any scientific controls. J.A. Winter, M.D., originally an associate of Hubbard and an early adopter of Dianetics, had by the end of 1950 cut his ties with Hubbard and written an account of his personal experiences with Dianetics. He described Hubbard as "absolutistic and authoritarian", and criticized the Hubbard Dianetic Research Foundation for failing to undertake "precise scientific research into the functioning of the mind". He also recommended that auditing be done by experts only and that it was dangerous for laymen to audit each other. Hubbard writes: "Again, Dianetics is not being released to a profession, for no profession could encompass it." What Hubbard touts as a science of mind lacks one key element that is expected of a science: empirical testing of claims. The key elements of Hubbard's so-called science don't seem testable, yet he repeatedly claims that he is asserting only scientific facts and data from many experiments. It isn't even clear what such "data" would look like. Most of his data is in the form of anecdotes and speculations ... Such speculation is appropriate in fiction, but not in science. Dianetics is nothing more than an example of pseudoscience trying to legitimize itself ... Hubbard, had he indeed been a scientist, would have known that truth is not built on axioms, and facts cannot be found from some a-priori knowledge. A true science is constructed on hypotheses, which are arrived at by the virtue of observed phenomena. Scientific knowledge is gained by observation and testing, not believing from some subconscious stipulation, as Hubbard would have us believe. The validity and practice of auditing have been questioned by a variety of non-Scientologist commentators. Commenting on the example cited by Winter, the science writer Martin Gardner asserts that "nothing could be clearer from the above dialogue than the fact that the dianetic explanation for the headache existed only in the mind of the therapist, and that it was with considerable difficulty that the patient was maneuvered into accepting it." Other critics and medical experts have suggested that Dianetic auditing is a form of hypnosis, although the Church of Scientology has strongly denied that hypnosis forms any part of Dianetics. To the contrary, L. Ron Hubbard expressly warns not to use any hypnosis or hypnosis-like methods, because a person under hypnosis would be receptive to suggestions. This would decrease his self-determinism instead of increasing it, which is one of the prime goals of Dianetics. Winter  comments that the leading nature of the questions asked of a pre-Clear "encourage fantasy", a common issue also encountered with hypnosis, which can be used to form false memories. The auditor is instructed not to make any assessment of a recalled memory's reality or accuracy, but instead to treat it as if it were objectively real. Professor Richard J. Ofshe, a leading expert on false memories, suggests that the feeling of well-being reported by pre-Clear at the end of an auditing session may be induced by post-hypnotic suggestion. Other researchers have identified quotations in Hubbard's work suggesting evidence that false memories were created in Dianetics, specifically in the form of birth and pre-birth memories. According to Hubbard, the majority of the people interested in the subject believed they could accomplish therapy alone. "It cannot be done" and he adds: "If a patient places himself in autohypnosis and regresses himself in an effort to reach illness or birth or prenatals, the only thing he will get is ill". ^ Gray, Eliza (5 October 2012). "The Mothership of All Alliances". The New Republic. Retrieved 19 November 2012. ^ Rossetter, Shelley; Tobin, Thomas C. (18 October 2012). "Louis Farrakhan renews call for self-determination among Nation of Islam followers". Tampa Bay Times. Archived from the original on 5 November 2012. Retrieved 19 November 2012. ^ Mohammed, Asahed (28 February 2013). "Nation of Islam Auditors graduation held for third Saviours' Day in a row". Final Call. Retrieved 22 April 2013. ^ Philosophers and Religious Leaders: An Encyclopedia of People Who Changed the World, Christian D. Von Dehsen & Scott L. Harris, Greenwood Publishing Group, 1999, ISBN 1-57356-152-5. (page 90). ^ "Official Church of Scientology Video: Auditing in Scientology, Spiritual Counseling". www.scientology.org. Retrieved 20 June 2015. ^ "Parts of the Mind, Analytical & Reactive, L. Ron Hubbard, Dianetics: Official Church of Scientology". www.scientology.org. Retrieved 20 June 2015. ^ Garrison, Omar V. (1974). The Hidden Story of Scientology. Secaucus, NJ: Citadel Press, Lyle Stuart, Inc. p. 26. ISBN 978-0-8065-0440-7. ^ a b c Garrison, Omar V. (1974). The Hidden Story of Scientology. Secaucus, NJ: Citadel Press, Lyle Stuart, Inc. pp. 23–24. ISBN 978-0-8065-0440-7. ^ Melton, J. Gordon (2000). Massimo Introvigne (ed.). The Church of Scientology. Signature Books. ISBN 978-1-56085-139-4. ^ a b Lewis, James R. (1997). "Clearing the Planet: Utopian Idealism and the Church of Scientology". Syzygy, Journal of Alternative Religion and Culture. 6 (1–2): 287. ISSN 1059-6860. ^ Klingbeil, José. "General Semantics vs. Scientology". Retrieved 25 August 2012. ^ Hayakawa, S. I. (1951). "Dianetics : From Science-fiction to Fiction-science". ETC: A Review of General Semantics. 8:4: 280–293. ^ "Of Two Minds". TIME Magazine. 24 July 1950. Retrieved 4 July 2008. ^ Sappell, Joel; Robert W. Welkos (28 June 1990). "Costly Strategy Continues to Turn Out Bestsellers Series: The Scientology story. Today: The Making of a Best-Selling Author. Fifth in a six-part series". Los Angeles Times. ^ McCall, W. Vaughn (September 2007). "Psychiatry and Psychology in the Writings of L. Ron Hubbard". Journal of Religion and Health. 46 (3): 437–44. doi:10.1007/s10943-006-9079-9. ^ Garrison, Omar V. (1974). The Hidden Story of Scientology. Secaucus, NJ: Citadel Press, Lyle Stuart, Inc. pp. 34, 46. ISBN 978-0-8065-0440-7. ^ Kapalko, Jamie (22 July 1999). "Copyright - or wrong?". Salon. Retrieved 3 December 2015. ^ Wallis, Roy (1975). "SCIENTOLOGY: THERAPEUTIC CULT TO RELIGIOUS SECT". Sociology. 9 (1): 89–100. doi:10.1177/003803857500900105. JSTOR 42851574. ^ "L. Ron Hubbard publishes Dianetics". HISTORY.com. 9 May 1950. Retrieved 25 August 2016. ^ a b c "The Creation of 'Religious' Scientology". Religious Studies and Theology. Archived from the original on 12 March 2007. Retrieved 8 May 2006. Originally published by Stephen A. Kent in December 1999. ^ Kent, Stephen A (2 December 1999). "The creation of 'religious' Scientology". Religious Studies and Theology. 18 (2): 97–126. ISSN 0829-2922. ^ a b Urban, Hugh B. (2011). The Church of Scientology: A History of a New Religion. Princeton University Press. ^ Gutjahr, Paul C. (2001). "Sacred Texts in the United States". Book History. 4: 335–70. JSTOR 30227336. ^ Gallagher, Eugene V. (2004). The New Religious Movements Experience in America. Greenwood Publishing Group. ISBN 9780313328077. ^ a b Miller, Russell (1987). "11. Bankrolling and Bankruptcy". Bare-faced Messiah, The True Story of L. Ron Hubbard (First American ed.). New York: Henry Holt & Co. pp. 305–306. ISBN 978-0-8050-0654-4. ^ Petersen, Jesper Aagaard (2014). Controversial New Religions. Oxford University. ^ Lebron, Robyn E. (2012). Searching for Spiritual Unity...can There Be Common Ground? : A Basic Internet Guide to Forty World Religions & Spiritual Practices. Crossbooks. ISBN 978-1462712618. ^ HCOB 6 May 69 II "Routine 3-R Revised, Engram Running by Chains"
^ "New Era Dianetics Auditing". Retrieved 5 October 2006. ^ L. Ron Hubbard New Era Dianetics Series 7RA, HCOB 28 June 1978RA revised 15 September 1978, Hubbard Communications Office (HCO). ^ "The Official Scientology and Dianetics Glossary". Scientology.ie. Archived from the original on 28 April 2009. Retrieved 22 November 2011. ^ Childs, Joe; Tobin, Thomas C. (30 December 2009). "Climbing The Bridge: A journey to 'Operating Thetan'". Tampa Bay Times. Retrieved 26 August 2016. ^ Cook, Pat (1971). "Scientology and Dianetics". The Journal of Education. 153 (4): 58–61. JSTOR 42773008. ^ Hubbard, "Dianetics". Astounding Science Fiction, May 1950. ^ Christensen, Dorthe Refslund (24 June 2016). "Rethinking Scientology A Thorough Analysis of L. Ron Hubbard's Formulation of Therapy and Religion in Dianetics and Scientology, 1950–1986". Alternative Spirituality and Religion Review. 7: 155–227. doi:10.5840/asrr201662323. ^ Atack, Jon (1990). A Piece of Blue Sky. New York, NY: Carol Publishing Group. p. 109. ISBN 978-0-8184-0499-3. ^ Letter from John W. Campbell, cited in Winter, p. 3 - "His approach is, actually, based on some very early work of Freud"
^ Joseph Breuer and Sigmund Freud, "Studies in Hysteria", Vol II of the Standard Edition of the Complete Psychological Works of Sigmund Freud. Hogarth Press, London (1955). ^ L. Ron Hubbard A Critique of Psychoanalysis, PAB 92, 10 July 1956. ^ Hubbard, L Ron (28 June 1978). "R3RA Commands". HCO Bulletin. New Era Dianetics Series 7RA. ^ Hubbard, L Ron (26 June 1978). "Routine 3RA Engram Running by Chains". HCO Bulletin. New Era Dianetics series 6RA. ^ Wright, Lawrence (2013). Going Clear: Scientology, Hollywood and the Prison of Belief. Knopf Doubleday Publishing Group. ISBN 9780385350273. Retrieved 27 January 2016. ^ Hubbard, Science of Survival: Prediction of Human Behavior p. 1, Bridge Publications, 1990 (reissue). ^ Urban, Hugh B. (22 August 2011). The Church of Scientology: A History of a New Religion. Princeton University Press. ^ "The Auditor," The Monthly Journal of Scientology, published by the American Saint Hill Organization, 1413 L. Ron Hubbard Way, Los Angeles, CA 90027, Issue 330, May 2006, page 7. ^ Kent, Stephen A.; Raine, Susan (2017). Scientology in Popular Culture: Influences and Struggles for Legitimacy. Santa Barbara, California: ABC-CLIO. ISBN 978-1440832499. ^ This description is based on "The Dianetics Procedure - 10 Simple Steps Archived 26 February 2003 at the Wayback Machine"
^ "Tests & Poison". TIME Magazine. 18 September 1950. Retrieved 10 February 2008. ^ See e.g. Gardner, Fads and Fallacies in the Name of Science; Bauer, Scientific Literacy and the Myth of the Scientific Method and Science Or Pseudoscience: Magnetic Healing, Psychic Phenomena, and Other Heterodoxies; Corsini et al., The Dictionary of Psychology. ^ Ari Ben-Menahem (2009). "Demise of the Dogmatic Universe". Historical Encyclopedia of Natural and Mathematical Sciences. Springer Berlin Heidelberg. pp. 4301–4302. doi:10.1007/978-3-540-68832-7. ISBN 978-3-540-68831-0. ^ Miller, Russell (1987). Bare-Faced Messiah: The True Story of L. Ron Hubbard. ISBN 978-0-8050-0654-4. ^ Atack, Jon (1990). A Piece of Blue Sky: Scientology, Dianetics and L. Ron Hubbard Exposed. ISBN 978-0-8184-0499-3. ^ Hubbard, L. Ron (October 1958). The Story of Dianetics and Scientology, Lecture 18 (Speech). by 1947, I had achieved clearing. ^ Levy, Alan (15 November 1968). "Scientology". Life. ^ Michener, Wendy (22 August 1966). "Is This the Happiest Man in the World?". Maclean's. ^ a b "Departure in Dianetics". TIME Magazine. 3 September 1951. Retrieved 14 February 2008. ^ "Science of Survival", L. Ron Hubbard, p. 461 (2007 edition). ^ "A Very Brief Overview of Scientology", Richard E. Ofshe, Ph.D.
^ Patihis, Lawrence; Burton, Helena J. Younes (2015). "False memories in therapy and hypnosis before 1980". Psychology of Consciousness: Theory, Research, and Practice. 2 (2): 153–169. doi:10.1037/cns0000044. ^ "A Doctor's Scathing 1950 Takedown of L. Ron Hubbard's 'Dianetics'". The New Republic. Retrieved 17 October 2018. ^ Dianetics: the Modern Science of Mental Health -5oth anniversary edition- pp. 443-4. Breuer J, Freud S, "Studies in Hysteria", Vol II of the Standard Edition of the Complete Psychological Works of Sigmund Freud (Hogarth Press, London, 1955). Gardner, Martin: Fads and Fallacies in the Name of Science, 1957, Chapter 22, "Dianetics"
Have You Lived Before This Life? L. Ron Hubbard, Messiah or Madman? This page was last edited on 16 April 2019, at 10:15 (UTC).